For other uses, see Ariel. Ariel is a spirit who appears in William Shakespeare's play The Tempest. Ariel is bound to serve the magician Prospero, who rescued him from the tree in which he was imprisoned by Sycorax, the witch who previously inhabited the island. Prospero greets disobedience with a reminder that he saved Ariel from Sycorax's spell, and with promises to grant Ariel his freedom. Ariel is Prospero's eyes and ears throughout the play, using his magical abilities to cause the tempest in Act One which gives the play its name, and to foil other characters' plots to bring down his master. Priscilla Horton as Ariel, 1838. The part was played by women from the mid-1600s to about 1930. From that time, both men and women played the role. Ariel’s name means Lion of God. Ariel may also be a simple play on the word "aerial". Scholars have compared him to sprites depicted in other Elizabethan plays, and have managed to find several similarities between them, but one thing which makes Ariel unique is the human edge and personality given to him by Shakespeare. Because the stage directions in The Tempest are so precise, critics and historians are better able to see how this play may have originally been performed than with other Shakespeare plays. Several of the scenes involving magic have clear instructions on how to create the illusion required, causing critics to make connections and guesses as to exactly what sort of technology would have been used in Shakespeare's troupe to stage Ariel's role in the play. Also, a line by Ariel in Act IV allows scholars to ask if the original actor for Ariel also played the part of Ceres, due to a shortage of boy actors. Ariel is widely viewed as a male character, although this view has wavered over the years, especially in the Restoration, when, for the most part, women played the role. Ariel has also been involved, though lightly, in the debate over the colonialist nature of the play, as scholars have tried to determine how he compares to the more rebellious Caliban in terms of service to the European Prospero. Whenever Caliban desired not to obey the command of Prospero, Ariel would persuade him to do the work, either by using magical powers or by using force. Ariel first appears in the second scene of the play to report to Prospero on his success in carrying out his command to shipwreck the King of Naples and his crew in a violent tempest. Ariel adds that, as commanded, he saw that none of the group were harmed, but that all landed safely on the island, scattered and separated along the coast. After being praised by Prospero, Ariel pleads for his freedom from the magician's service in return. Prospero declines, reminding him of the state he was in before Prospero rescued him: Ariel had been trapped by the witch Sycorax in a "cloven pine" as a punishment for resisting her commands. After 12 years of pain (and the death of Sycorax), Ariel was released from his prison by Prospero, who pressed the spirit into his service. The magician denies Ariel's request for freedom at this time, but promises that on the condition he follows the rest of his commands, he will grant his wish in two days. 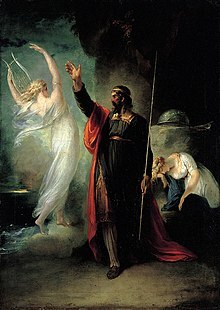 For the rest of the play, Ariel is Prospero's eyes and ears—spying on the shipwrecked sailors in invisible form, but only Prospero can see Ariel. In the second act Ariel briefly appears to stop a conspiracy to kill Alonso, King of Naples, whose brother (and heir to the dukedom), Sebastian, plots to kill him in his sleep. Ariel sings in the ear of Gonzalo, a councillor to Alonso, to wake him and foils the plot. Ariel also appears in Act Three to foil Caliban's plot to turn the sailors against Prospero and murder him. Later in the same act, he appears with a clap of thunder and rebukes those who were involved in the plot to banish Prospero to the island, displaying his fearful power to the men. He is later called on to gather the spirits of the island before Miranda and Ferdinand, and to bring Trinculo, Stephano, and Caliban before Prospero for judgement. In the final act, Ariel releases the prisoners of Prospero and awakens what is left of the crew of the ship from a deep slumber. Thanks to Ariel's work, Ferdinand and Miranda have fallen in love. Prospero is so impressed by Ariel's matchmaking that he says that he would set Ariel free for that one act. Thus, having fulfilled Prospero's tasks, and Prospero himself now being free to leave the island, Ariel is set free. "[Aerial spirits] can descend to lower regions quicker than thought, and, having taken on bodies from the denser air, appear visibly at times.... These spirits often disturb the air, stir up tempests and thunders. They do not retain one form, but take on various forms...."
– Randall Hutchins, on the nature of sprites in Shakespeare's day. The '-el' ending of Shakespeare's name translates in Hebrew as 'God', placing Ariel inline with more benevolent spirits, many of which were listed in sorcery books published in Shakespeare's day with similar suffixes. Jewish demonology, for example, had a figure by the name of Ariel who was described as the spirit of the waters. Another spirit, Uriel, is also comparable. In Isaiah 29, Ariel is mentioned as another name for Jerusalem. In the Geneva Bible, which Shakespeare and others of the time would have known, the entry carries an interesting footnote describing this Ariel as the "Lyon of God." Further descriptions of this Ariel as having the power to confuse and weaken his enemies with sounds and tempests increase the parallel. The name Ariel might also be a simple derivation of aerial, though the character's abilities stretch beyond those of a typical air demon, encompassing fire and water demon abilities as well. Other scholars propose that the ca. 1589 play John a Kent and John a Cumber contains a character which may have been Shakespeare's inspiration. The character, named Shrimp, is also an air demon controlled by a magician. A few scenes of the play feature this demon performing tasks nearly identical to those Shakespeare's Ariel performed. Since it is very likely Shakespeare was familiar with the play, it is possible that Ariel is based on Shrimp, but evidence remains inconclusive. 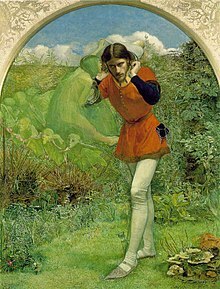 Though the actual source Shakespeare used has not yet been determined, it seems clear that Shakespeare's Ariel and his relationship with Prospero reflects more closely the Renaissance idea of a neutral spirit under the control of a magician than the religious idea of a sprite. Shakespeare, however, refuses to make Ariel a will-less character, infusing him with desires and near-human feelings uncharacteristic of most sprites of this type. The text of The Tempest contains more stage directions than most of Shakespeare's plays, giving scholars an opportunity to see into the portrayal of characters such as Ariel in Shakespeare's time. In Act III, Scene III, for example, when Ariel, as a harpy, is directed to clap his wings on a banquet table, he causes the food to disappear by a "quainte device". Scholars have tried to discover just what sort of "quainte device" would have been used by the King's Men in portraying this scene. Ariel's actor would have been unable to hide the food himself, having harpy wings over his arms which cumbered movement. The actor would not even have been able to sweep the food into a receptacle behind the table, since the theatre had seating on three sides. What was needed was some sort of device to act on the signal of Ariel slapping his wings on the table. This device was probably a false table top which could be tripped by a boy underneath while the harpy's wings covered the food. When the wings lifted, the food would be gone, apparently by magic. Later in act three, when Ariel appears and disappears with thunder, another trick was probably used, involving some sort of basket on wires, covered in cloud designs, which the Globe theatre then had. Ariel may have descended from the air in this device as a harpy, spoken his lines, and ascended in the same device. Ariel may have descended on the back of an eagle, rather than clouds, or with no device at all—wires being attached to his harpy wings. Later Act IV, Scene 1, Ariel says: "when I presented Ceres / I thought to have told thee of it / but I feared lest I might anger thee." Earlier in the same scene, Ceres, along with Iris and Juno, had appeared at Prospero's command in a Masque. Scholars have wondered whether Shakespeare originally intended the actor for Ariel to cover Ceres' role, and give it away in this line. The need for a dual role may have been caused by a shortage of boys capable of playing female parts (boys usually played all female roles in Shakespeare's day) as there are many female roles in The Tempest. This changing of parts requires a change in costume, which explains a lot of Ariel's delay in scene four in carrying out Prospero's orders. Time is allowed for the character to change from Ariel to Ceres and back. On the other side, Ceres may have been associated, by Shakespeare, to the Kairos figure, related to rhetorics, personating the opportune moment to present the convincing argument in a speech. Early critics were sceptical of the idea, saying that "presented Ceres" could merely mean that Ariel introduced Ceres to the gathering. More recent studies, however, have revealed that, given the small number of boys travelling with the King's Men and the large number of parts for them to fill, there would have been little choice in the matter. The entire scene comes together in a way that leads scholars to believe that the Masque scene with the three goddesses was added as an afterthought to work around costuming and role-playing issues. Originally, the role would have been assumed by a boy-player, but beginning in Restoration adaptations, it would have been played by a woman. Since the male actor Leslie French played the part in 1930, the role has been played by both men and women. In the 2010 Julie Taymor film version of the play, Ariel is played by Ben Whishaw, but in that same year's Stratford Shakespeare Festival version of the play, also filmed and available on DVD, Ariel is played by Julyana Soelistyo. In the Summer of 2013, Colin Morgan played Ariel in the Globe Theatre in London. Beginning in about 1950, with the publication of Psychology of Colonization by Octave Mannoni, The Tempest was viewed more and more through the lens of post-colonial theory. This new way of looking at the text explored the effect of the coloniser (Prospero) on the colonised (Ariel and Caliban). Though Ariel is often overlooked in these debates in favour of the more intriguing Caliban, he is still involved in many of the debates. The French writer Aimé Césaire, in his play Une Tempête, sets The Tempest in Haiti; Ariel is portrayed as a mulatto who, unlike the more rebellious Caliban, feels that negotiation and partnership is the way to freedom from the colonizers. Fernandez Retamar sets his version of the play in Cuba, portraying Ariel as a wealthy Cuban (in comparison to the lower-class Caliban) who also must choose between rebellion or negotiation. Although scholars have suggested that his dialogue with Caliban in Act two, Scene one, contains hints of a future alliance between the two when Prospero leaves, in general, Ariel is viewed by scholars as the good servant, in comparison with the conniving Caliban — a view which Shakespeare's audience would have shared. Ariel is used by some postcolonial writers as a symbol of their efforts to overcome the effects of colonisation on their culture. Michelle Cliff, for example, a Jamaican author, has said that she tries to combine Caliban and Ariel within herself to create a way of writing that better represents her culture. Such reference to Ariel in postcolonial thought is not uncommon; Ariel is even the name of a scholarly journal covering post-colonial criticism. Kelsey Ridge argued that Ariel, and not Caliban, is the rightful owner of the island and that Caliban, who claims the island, is the son of the colonizer who stole the island from Ariel's people. The character of Ariel, as played by David Brandon, appears in the 1978 film Jubilee as a guide for Queen Elizabeth I visiting Queen Elizabeth II's England. Jubilee's director, Derek Jarman, subsequently directed a film of The Tempest in 1979. Ariel appears in The League of Extraordinary Gentlemen as part of the first incarnation of the group, Prospero's Men, alongside her master and Caliban. Ariel appears in the song "La Romance d'Ariel" with music by Claude Achille Debussy (1884) and text by Paul Bourget. In Aldous Huxley's dystopian novel Brave New World, the character John Savage remarks that "Ariel could put a girdle 'round the Earth in forty minutes" when shown the elaborate equipment in the World State in chapter 11. However, this line is in fact said by Puck from Shakespeare's A Midsummer Night's Dream, making the quote inaccurate. A monster in the 2007 video game Silent Hill: Origins is named after and inspired by Ariel. A Titan in the Huntik: Secrets & Seekers franchise is named after and inspired by Ariel. In the 2012 series Grandma's House, the character played by Simon Amstell is offered the part of Ariel. The novel series Théâtre Illuminata, by Lisa Mantchev, stars Ariel as one of the main characters, and he persists as so throughout the trilogy. Sylvia Plath's most famous book of poetry is called Ariel. It is named so because she considered the poem to be the best in the book. Many readers know that the title of the poem was changed to "The Horse" for the less discerning newspaper readers and think the poem Ariel is simply about her riding a wild horse. Others, however, such as Nick Mount on YouTube, consider Plath's earlier childhood fascination with The Tempest's character Ariel and view the poem as talking about creativity and the dangerous direction her creativity was taking her. Ariel Durant, wife of historian Will Durant and joint winner of the 1968 Pulitzer prize and the 1978 Presidential Medal of Freedom, took her name from Ariel in The Tempest. One of the castaways in Lemony Snicket's novel The End is named Ariel; the book contains other allusions to The Tempest. Ariel appears in the second season of The Librarians. 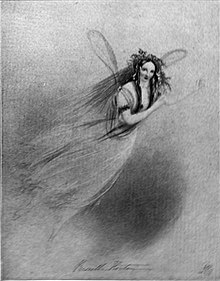 She is presented as an actual fairy, having been sucked into The Tempest by Prospero when Shakespeare wrote her into the play. For most of the season, she appears as a small blue sprite imprisoned within Prospero's pocket watch. However, in the episode "And the Happily Ever Afters", she disguises herself as a human (Hayley McLaughlin), with the watch on her necklace. She helps free the Librarians from Prospero's illusions, and is subsequently freed when the watch is destroyed in the real world.